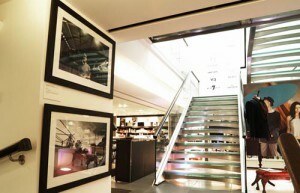 A collection of works by three emerging artists exclusively at Harrods. Art is a constant reference and inspiration for creative director Johan Lindeberg in designing the J.Lindeberg collection. It was a natural extension to provide a platform for young artists to exhibit their work, forging a new relationship supporting creative talent. The theme for the AW08 collection, The Elegant Bohemian was interpreted by each artist. 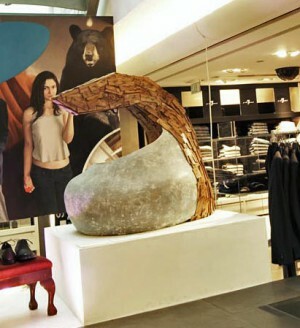 Working within different mediums; photography, sculpture and painting the artists referenced nature, architecture, and fashion in creating unique pieces. Ryan Barrett has created this masculine, bold water sculpture of two contrasting textures. Taking influence from natures structural engineering and visual inspirations around him, bringing both nature and manmade materials together. The varied media of the piece is highlighted by the elegance of the water set against the smooth solid base, bohemian burnt wood and brass metal fittings. Ryan’s work concentrates on the aesthetics and the discarded values of abandoned objects. Thus changing the perception of values within objects taking them away from their original urban environment, forming a new sculptural context with water. Ryan graduated in fine art from Goldsmiths University earlier this year. Joel Ely’s striking composition (Adham, Annabel, Copper, Cadium, 2008) painted on canvas suspended from a glass staircase is based on two creatives / performers based in East London. The artist Adham Faramawy, whose work involves performances, video and objects. The actress / comedian Annabel Bashford whose work focuses on animals and the absurd. The composition comes from creating a tableaux of various iconographies and images these people deal in. The copper and cadium of the title refers to the pigments used in making the turquoise and red paint of the flat shapes. Leo studied photography at school and ‘Film Making’ at the New York Film Academy. On moving back to London Leo became a freelance photographic assistant, working for photographers including Nick Knight, Corinne Day, Robert Erderman, Hamish Brown, Liz Collins and Matt Jones. Leo is currently working as a freelance photographer in London.